Get your tickets to one of the most attractive shows and enjoy the Parrots Rock by playing this interesting 5-reel 4-row 30-payline video slot machine produced by Spinomenal. Featuring Mega Symbols, Win Multipliers, Wilds, Stacked Wilds, and Free Spins, the game also introduces innovative Prize Box with a maximum payout of 150 coins. 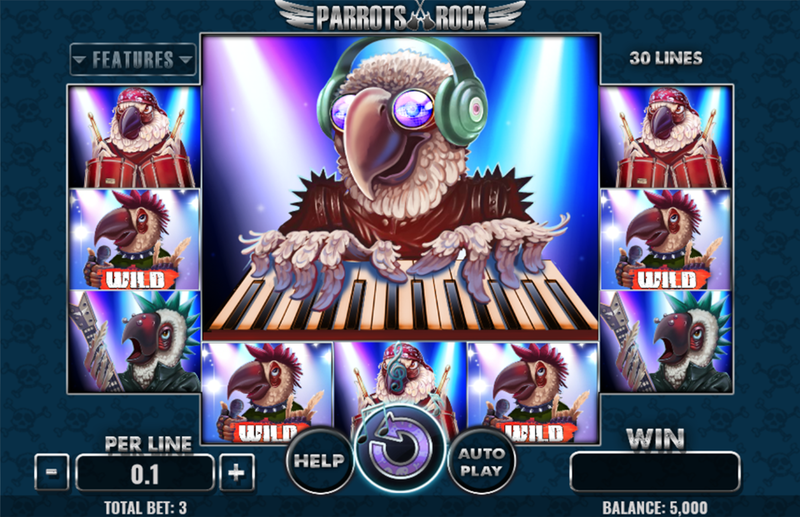 Enjoy this interesting game, but first, read the Parrots Rock slot review and get some valuable winning tips. Unfortunatly, we have no free play mode for Parrots Rock available. Check out the screenshots below and hop right into action with one of the recommended casino sites! Set in the scenery of a stunning rock concert, this is a game you can play for fun or for real money. In many cases, newbies will opt for the Parrots Rock Free Play mode as it grants enough demo credits they can use to learn how to win or work on a specific betting strategy. One thing remains the same no matter of your choice: to receive a payout, you’d have to line up 3 or more symbols of the same kind placed on adjacent reels from the leftmost. Also, the coin value ranges from €0.01 to €10, allowing players to wager between €0.30 and €300 per round. Picturesque parrots, members of our rock band, are icons with the highest rating as they appear as Mega Symbols and may occupy 2x2 or 3x3 base on the reels 2, 3 and 4. Drummer, Guitarist and Piano Player pay between 30 and 150 coins for combinations of 3 to 5 of a kind. Earphone and Microphone are the second-best choices as they pay 20, 40 or 80 coins for combinations of 3, 4 or 5, respectively. At last but not the least, lower-paying cards from Jacks to Aces bring a maximum of 60 coins. Wilds may replace all other items, but the Scatter and Free Spins icon. Moreover, you’ll receive an extra prize of 150 coins for 5 Wilds landed on an active payline. During the base game, Stacked Wilds may appear all of a sudden and land on the reels 1 and/or 5 giving you more chances to land a big win. With 1 free spins icon on the reel 1 and 1 on the reel 5, you will automatically release 10 Parrots Rock Free Spins. During this round, while the reels are still spinning, you’ll notice a Prize Box awarding with either a cash prize with a Win Multiplier or some extra spins. Finally, when 1 or more Parrots Rock Bonus symbols appear during the base game, the luckiest winners can score an Instant Win. As a title built in the HTML5 technology, this game comes with a full mobile compatibility. You can play online on various sites powered by Spinomenal, which doesn’t require any app to download on your Android or iPhone. 3. What is the RTP factor of Parrots Rock? According to the official info, the RTP stands at 94.50%. Our Parrots Rock recension proved this figure to be correct. After a short break, music-themed slot machines return in great fashion. This time, a likable band of parrots will rock you, presuming you’re experienced enough to stand against the house edge. Surely, we recommend you to try this interesting release and listen to its captivating soundtrack.